IN 12TH CENTURY JAPAN, the Minamoto and Taira clans vie for power while retired Emperor Go-Shirakawa plays his rivals against one another. One of the three factions will triumph to impose the coming social order. In the shadow of these elite powers, a few ninja scheme to exploit the chaos. Daring raids, skill mastery, and subtle intrigue are essential to establishing one’s honor. When the new era dawns, one ninja will flourish as the Ninjato, the Invisible Sword of the ruling family. IN THE ROLE OF A MASTER NINJA, each player practices in the dojo, learns esoteric skills from the sensei, raids clan-controlled houses to steal fabulous treasure, inﬂuences envoys, spreads rumors in the pavilion, and ultimately tries to become the most legendary ninja of the age. Jeremy's notes: Ninjato is an excellent Euro Style game that is themed around the Japanese legend of the Ninja. Simple to learn, yet deceivingly strategic, Ninjato easily presents itself as one of the Best Games of 2011. In Ninjato players are competing Ninjas trying to gain points by infiltrating different clan houses to steal treasures and using those treasures to spread rumors and influence envoys. Players do this by taking 3 turns over 7 rounds with scoring occurring after the 3rd, 5th, and 7th round. Other scoring is dispersed throughout the different turns. On their turn a player can try to steal treasure from a house, influence an envoy by using stolen treasure, learn a new skill to help them in stealing treasure, spread a rumor by spending treasure (these are basically end game bonus points for set collection), or draw additional cards to be used later. Then at the end of the game a final scoring happens and the winner is declared by all other players bowing to him or her! The components in Ninjato could not be better. The art evokes the theme very well. The board itself has that wax-like finish that many games have, especially from Z-Man games. I really enjoy this type of finish on a board. It is also very functional for placing pieces on it. The absolute best part about the components though is the very large throwing stars that players use to indicate what action they are taking each turn. These really make the game jump out to passer-bys when playing in a public setting! These likes and dislikes will of course be from a personal standpoint, but they hopefully will give you some indication of what about the game may make it worth it for you to get. 1. I love the theme! There aren’t enough Ninja themed games out there. Now, you do have to remember that this is a Euro-style game and so the theme isn’t absolutely prevalent in it like it would be in say War of the Ring or Descent, but it fits the mechanics well. That combined with the art, just does it for me. 2. The high/low mechanic used for stealing treasure from clan houses really makes the game. Trying to determine how well your hand is suited to going the stealth or strength route and then using your skills at the appropriate time to try and get the treasures you need. There are plenty several games out there, Aladdin’s Dragons is one, which uses a “guard” to protect something. In those games though, you always have to go over the guards number to beat them. Giving the option to go above or under the guards strength just adds enough tweak to make it more fun. 3. The tightness of the envoy race is also something I like quite a bit. Basically, when it comes to envoys, you are trying to have the most in each of the 3 colors. However, throughout the game, you aren’t getting 10, 15, or 20 of these envoys. Instead you are getting only 1, 2, or maybe 3 of them. So it makes each one you get extremely important. By giving each envoy, an age (tie-breaker), it makes the game much more tense in trying to get that older green colored envoy to win the tie. 4. Comparisons to Stone Age. As soon as this came out, people began comparing it to Stone Age, which I’ve never understood. Sure it has the rumor cards and Stone Age has the huts which score more the more you have. Many games have this end game scoring mechanic though including 7 Wonders, St. Petersburg, and others. Ninjato, to me, has much many more meaningful decisions that Stone Age and also is more fun to play. I like Stone Age just fine, but it isn’t one that has found its way into my collection, where Ninjato did. Simply because Ninjato offers these decisions that I don’t feel Stone Age does. 5. A knock that I can see coming against Ninjato, which for me doesn’t matter as much, is that there is potential to be screwed by the luck of the draw when it comes to getting treasures from the clan houses. For people who want zero luck in your games, then Ninjato probably isn’t for you, but for me there is enough luck in it to make it exciting, but not so much I don’t feel that good players won’t win the vast majority of the time. If you couldn’t tell from reading this far, Ninjato is a game that will remain in my collection. It offers good strategy and fun in a 90 minute time frame. The pieces and board are great, rules are extremely well laid out, and for a gamer’s game here you can’t go wrong. Also, who doesn’t want to play a game that you yell, “bonsai!” throughout the game? In Ninjato, you are playing a ninja that will be stealing treasure from the different clans and using the treasure to influence envoys and to gather rumors. The artwork is spectacular on the board and cards and the wooden Shuriken are awesome! Ninjato is played over 7 rounds where. In each round, Players will be sending their ninja (placing a wooden shuriken) to one of the 5 areas on the board. Each area gives a different action that the player can take. 1) The Dojo is where players will be able to replenish Dojo cards in their hand. 2) The Clan Houses are where a player will attempt to defeat guards (some elite!) to steal treasure and possibly change the clan token on that house. 3) The Palace is where the players will use the treasure to acquire Envoy cards. 4) The Pavilion is where players will use treasure to acquire Rumor cards. 5) The Sensei is where players will acquire skills to use to become more powerful. After everyone has placed each of their 3 shuriken, cards and treasures are refreshed and a new round begins. First, Players will score the point value of every treasure they use to acquire Envoy and Rumor cards. In the scoring rounds, each clan house is scored in the order listed on the board. The player with the most envoys of each house will be able to either score points equal to each house on the board or select a rumor card for free. The Player with the second most envoys of each house will gets what is left (either points or rumor card, depending on what the first place player choose). In case of a tie, the player who has the Oldest Envoy wins. I really like Ninjato. The theme is good and there are lots of tough decisions to make throughout the game. I have played it 2-player, 3-player and 4-player and it plays well in all cases, but I think the games plays best with 4 players. When we went to GenCon last year, I heard this game was going to be available in limited quantities. That’s the only reason I wanted to get myself a copy. A friend of mine was also getting a copy and he convinced me that the buzz he heard on the game was pretty good. I had no idea I was going to have as much fun as I did after I got it. I actually bought another Ninja game by AEG which I also enjoyed but not as much as this one. There are many ways to win this game so your strategy can depend on how other players on playing. That in itself makes the game lots of fun and depending on who you play with, can change how you play the game. I won’t go into details of how to play it but if you are looking for a fun game with many paths to victory try this one out. The Ninja theme adds a nice touch. I have enjoyed this Game several times, and am delighted to own a copy. One of the best things about it, is that by the end, most players can easily be close in score, and upsets are quite possible. This is due to the endgame scoring vs the in game scoring. In game you score for treasures used, and during the 3 scoring rounds, you can gain additional score from your envoys, and control of houses. During the endgame you score your rumors which multiply their bonus based on the repeats you have. That’s why people claim it’s like stone age. However, there’s a limit of 4 / multiplier.. so the 5th one makes a new set, plus they are less limited than stone age. This produces the effect that several people can get into the rumor “business” effectively. Overall it’s a great game, and you shouldn’t count any player out till the end. This game is a “must have” for all gamers. Great interaction and mechanics makes it a game for every game´s night with friends. Besides it´s a fast game but with quality playability. You´ll wont see the time passing. This game is on my wish list and I intend to buy it as soon as I can. Ce jeu est vraiment génial si vous cherchez un certain défi intellectuel. En effet, vous devrez choisir un nombre d’action assez restreint afin de faire le plus de point possible. Le thème est un délice, le matériel est juste et bien désigné! 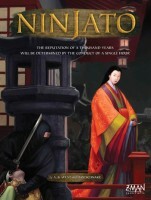 Add a Review for "Ninjato"